Bill & Ed’s Excellent Adventure. Ed Reed: A perfect 10. If you love Ed Reed so much, why don’t you marry him? For a man of few words, you sure can’t stop talking about the safety of a conference rival. Not exactly motivational for the safeties on your own team. By the way, my name isn’t Brandon Meriweather. Not even close. Simmer down, Ihedigbo! You should take a page out of Ed Reed’s playbook and shorten your name to two syllables. It’s amazing how much Ed Reed can get done with 1 vowel and 2 consonants. Ed Reed. What a name. What a player. What was your question again? 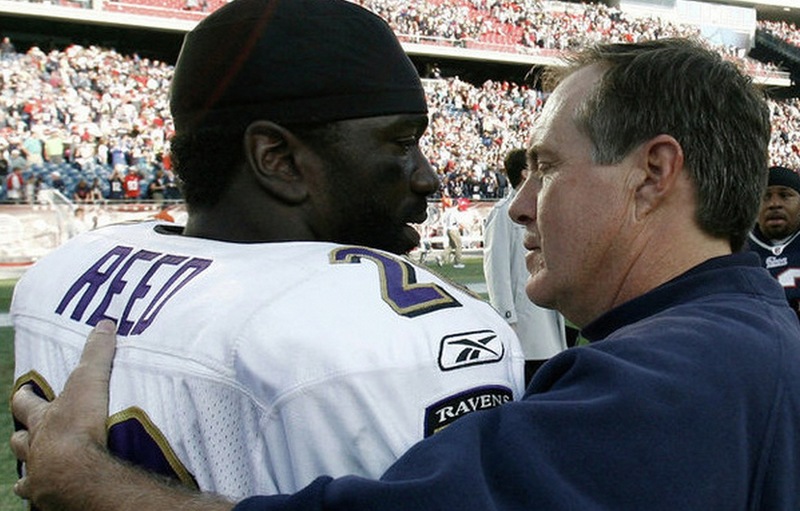 Ed Reed is not in your division–he’s in your conference. Anyhow, how ’bout you focus on the Ravens offense. Dumbass. Is that you, Derrick Mason? You must have a lot of time on your hands now that you’re out of the game. Maybe you should take up a hobby, like whittling or Remote Control Sailboat Regattas. Anyway I’ve got my hands full planning for Ed Reed but I appreciate the advice. I’ll focus on the Ravens offense, but only when they’re standing between me and Ed Reed. Speaking of Ed Reed, you’re no Ed Reed, but then again who is?